Many businesses, especially those that appeared online in the 1990s, invested large amounts of time and money deploying complex identity authorization systems across their business. A large number of these systems have web access management, or WAM, as their central design metaphor. At one point, WAM was one of the most common ways for large companies to handle identification and resource access inside their businesses. As time passed, however, these kinds of systems have grown increasingly expensive to maintain, and most are unprepared for the kind of threats and issues that businesses need to worry about today. In other words, legacy WAM solutions leave your business exposed. "Web access management systems are expensive to maintain and unprepared for the threats of today." First appearing in the 1990s, most WAM products also permitted the use of limited single sign on (SSO)—allowing users to sign in with their credentials on one domain and then use those same credentials to access data on other domains without signing in a second time. WAM products were generally deployed using one centralized authentication server and as many individual agents as necessary to cover all of a corporation's web servers. 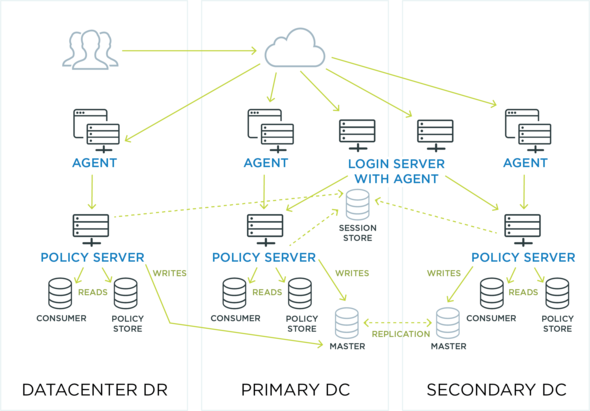 In this traditional on-premises setup, requests for access went from users to the agents on individual servers, each of which would call back to an external server to either approve or deny access. Web access management systems could also be set up using proxy servers (in which all requests would flow through a single proxy server) or tokens (in which users use individual tokens to gain access to the resources they need). 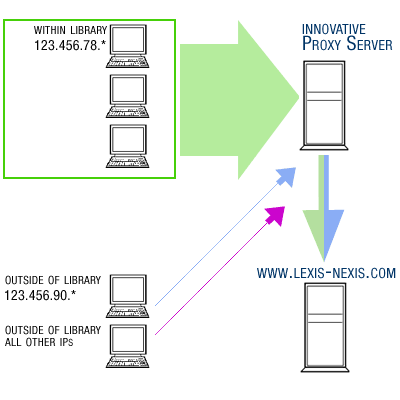 How a proxy server works. Requests flow from servers within the library (network) to a proxy server on that local network, and finally out to the external internet. All of these types of deployments were complicated, expensive (and even more expensive to maintain) and rooted tightly in an “on-premises” model—where the perimeter of your network is limited by the perimeter of your building. Today, most organizations are moving on and migrating to more integrated identity management (IdM) and identity and access management (IAM) solutions. The primary difference between legacy web access management and more modern identity and access management is the comprehensiveness and flexibility of the solutions they offer. Web access management systems don't generate user identities, provision them or maintain those identities over time. They rely on an identity provider—an IdP—to do that. 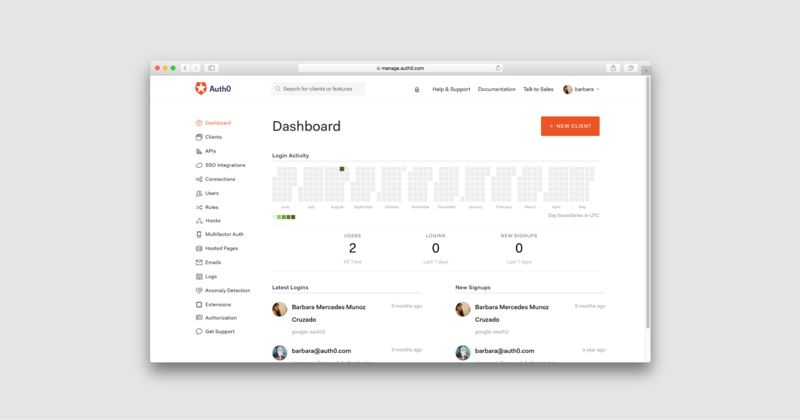 The Auth0 web management dashboard. Slowed development time: Maintaining interoperability between your IdP and WAM—and maintaining your network architecture requirements more generally—means you'll be slower to push out new applications, both internally and for your customers. Security vulnerabilities: Because of the maintenance needs of legacy WAM setups, and their general inflexibility to new technologies, they can leave both you and your customers vulnerable to security breaches. Customer engagement: Modern marketing and analytics tools that can help you leverage customer data in powerful ways to retain and acquire new revenue require modern, integrated identity solutions. An IAM like Auth0, on the other hand, can serve as an IdP or identity provider (although you can use your own IdP as well, of course), an identity manager (for provisioning/maintaining user identities) and an access manager (for your native, mobile or web applications). The biggest reason why IAM is surpassing the role of WAM in the modern day is the cloud. The traditional on-premises identity management that many enterprises have used for decades served its purpose. Today, however, more and more of the activity in the workplace is not literally in the workplace. It's in the coffee shop, or at a co-working space, or at home, or on the road—and no matter where your employees are, they will most likely need to access some kind of privileged resources every day. "Identity management is surpassing the role of web access management because of the cloud." The cloud makes identities more complex because it removes the on-prem notion of “perimeter security.” You can no longer protect your company's network by just securing your four walls—your notion of security must extend to all the BYOD devices and public wireless networks that your employees are using to do their work. Legacy authentication tools sold themselves to their customers with the promise of airtight, long-term security. But the world those authentication tools must live in has changed. Auth0 is SOC 2 Type II certified and offers HIPAA BAA agreements to healthcare companies that must comply with HIPAA regulations as part of their business. Auth0 also conforms to the OpenID Connect protocol and the new EU-U.S. Privacy Shield Framework for data privacy. Whether you're migrating from a WAM provider, looking to extend your current system of enterprise federation, or just looking to learn more about what identity and access management looks like today, read more about us here.